I have learned that I will be receiving the European Union Studies Association (EUSA) Lifetime Achievement Award at the 2019 EUSA International Biennial Conference in Denver next May. The plenary honoring Schmidt at the conference will include Tanja Börzel (Freie Universität Berlin), Matthias Matthijs (Johns Hopkins University), Kalypso Nicolaïdis (University of Oxford), Fritz Scharpf (Max Planck Institute and recipient of the 2007 EUSA Lifetime Achievement Award), George Ross (Université de Montreal and recipient of 2017 EUSA Lifetime Achievement Award), and Alberta Sbragia (University of Pittsburgh and recipient of 2013 EUSA Lifetime Achievement Award). The Lifetime Achievement Award honors a scholar in the field of EU studies whose lifetime of research and writing have been important, enduring, and widely felt influences on EU scholarship. I was honored to receive the SWIPE Mentor Award by the International Studies Association in February. The SWIPE Mentor Award pays tribute to women and men who have invested in the professional success of women in the IPE field. Originating in the early 1990s, the Society for Women in International Political Economy (SWIPE) observed that many women in IPE did not have the close mentoring relationships that their male counterparts seemed to benefit from. Indeed, while research across disciplines has shown that mentoring can be key to higher publication rates and successfully achieving tenure, women tend to get less mentoring than men. I was awarded a prize for best paper published in BJPIR (the British Journal of Politics and International Relations) 2013, for my paper entitled, “Speaking to the Markets or to the People? A Discursive Institutionalist Analysis of the EU’s Sovereign Debt Crisis.” The prize was announced at the Political Studies Association Annual International Conference, at the conference dinner on the evening of March 31st, 2015 in Sheffield, UK. The paper argues that the EU’s sovereign debt crisis is not just economic; it is also political, resulting from the failure of EU leaders to offer solutions that calm the markets and convince the people. These failures stem from problems with EU leaders’ ideas about how to solve the crisis as well as their communication about them. That communication encompasses not just EU leaders talking to one another in negotiations of crisis solutions but also speaking to “the markets’ and to ‘the people’ about those solutions, all of which may interact in perverse ways. 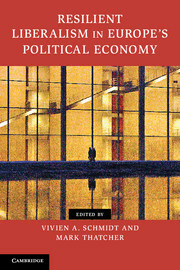 My article uses the analytic framework of “discursive institutionalism” to consider the different forms, types, levels, rates and mechanisms of change in ideas followed by the EU leaders’ discursive interactions in the “coordinative” discourse and their “communicative discourse” to the global markets and European publics. It uses a range of country cases, but in particular Germany and France, in illustration. Vivien Schmidt’s 2006 book, Democracy in Europe (Oxford University Press) has been included in a comprehensive selection of 100 Books on Europe to Remember. The list includes academic, intellectual and political works on the European idea and the development of the European integration process, taking into account the vast geographical, linguistic and intellectual spectrum of ideas. It was compiled by the European Parliamentary Research Service in order to encourage exploration of the ideas and individuals that have inspired and guided the creation and growth of the European Union. A special celebration to discuss the books and pamphlets that have made a significant contribution to the understanding of European integration was held on March 3 in the European Parliamentary Research Service library reading room. Participants included Joseph Weiler, Kevin Featherstone, Beatrice Taulegne, and Luuk van Middelaar. Martin Shulz, President of the European Commission, introduced the event. Recently, I was awarded a research fellowship by the European Commission, Directorate General of Economic and Financial Affairs (DG ECFIN). It involves my producing a paper entitled “The Political Economy of the European Monetary Union: Rebuilding Trust and Support for Economic Integration.” The fellowship program itself encompasses approximately ten fellows, all economists except for me (a political scientist). In addition to writing a very long research paper for publication in DG ECFIN’s paper series, I am to participate in three workshops over the course of a year (june 2014-June 2015), plus be available for 30 hours of consultations. The fellowship program was established in view of the seating of the newly European Parliament and the newly appointed Commission President and Commissioner head of DG ECFIN. We are to provide advice to the new Commissioner with regard to current and future policy. In my own case, I will be considering not just how to rebuild trust and support for economic integration but the problems with the current policies that make rebuilding trust very difficult. In my research, I will be examining not just problems with the economic policy performance (often termed output legitimacy in EU studies ) and the increasingly volatile politics resulting from citizens’ view of the EU as unresponsive to their concerns (input legitimacy) but also the quality of the governance processes (which I term ‘throughput’ legitimacy). I will be interviewing of EU officials to get a fuller sense of the political dynamics of crisis resolution, as EU institutional actors have sought to get beyond the rigidities of the initial crisis response to economic governance that established a set of numbers-targeting rules focused on austerity and structural reform that have not worked. I will be considering how EU officials in different EU institutions may go about informally reinterpreting such rules as well as how they legitimate any such reinterpretations.